This unique full-day conference will focus on the exposure and issues that can be associated with Internal Malpractice within the public and private sectors. The conference will provide a distinct and exciting opportunity to discover the reasons why individuals commit offences and how organisations could have protected themselves. The conference would be suited to any organisations (public and private sector) who are medium to large in structure and who are exposed to the threat of internal malpractice that requires professional management and direction. 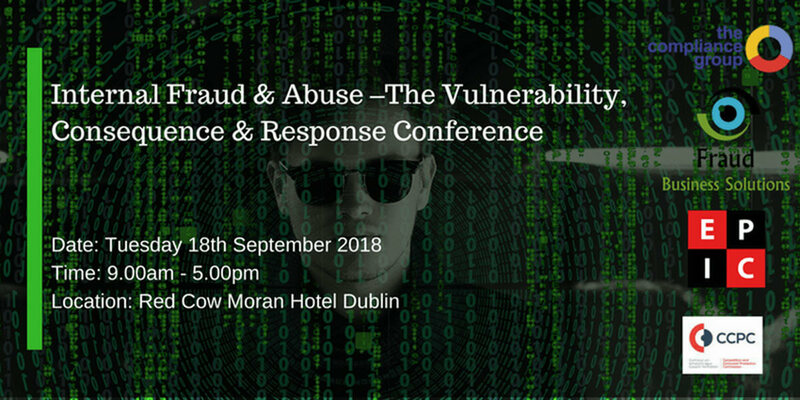 This conference will provide a distinct and exciting opportunity to discover the reasons why individuals commit offences, defined as internal malpractice, and how organisations could have protected themselves. The conference will also provide a parallel incite from experienced investigators in how they have investigated and managed such offences in both the public and the private sector. This offering will be supported by presentations and talks from a convicted fraudster who will share their personal story and provide an opinion as to why these offences were allowed to occur. Finally, attendees will be provided with presentations that directs organisations how to undertake effective interviews as part of an investigation. Tony Reilly (MACI) Addiction Counsellor and former An Post Branch Manager. Presentation Title: What good thing will come of this? Daniel Miller – Speaker & Panellist. Presentation Title:The enemy within. Kevin Sweeney – Senior Regulatory Consultant, Compliance Group. Presentation Title: The role of the interview in the investigation. Michael Fitzgerald – Director, Fraud Business Solutions. Presentation Title: Corporate Investigations- the pitfalls and hurdles. Paul Hanna – Deputy Director of Criminal Enforcement, Competition and Consumer Protection Commission. Presentation Title: Investigation response and management in the public sector. This event is currently undergoing accreditation for CPD hours.